AD-Net AN-UM-SMC-10G 10G Base-T to 10G Base-R media converter is designed to meet the various needs for extending network segments and can extend a copper based network via fiber cable to a maximum distance up to 80km. (Depending on which SFP is used). AN-UM-SMC-10G supports two types media for network connection such as 10GBase-T and 10GBase-FX. 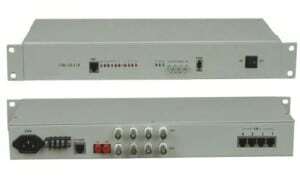 The bridge media converter is designed with a 10Gbase Ethernet PHY chip that smoothly connects two types segment operations. Place the converter in a clean, flat, and safe location that has easy access to AC power. 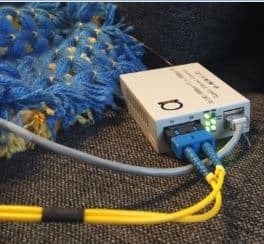 Connect a Cat7 ethernet cable to the RJ45 port of the media converter. Insert a 3.3V SFP (Small Form Factor Pluggable) module into the slot. Remove the dust cover plugs from the SFP transceiver module. Identify the TX and RX legs of your duplex fiber optic cable and then match them up with the SFP transceiver module. Insert the appropriate connectors into the SFP Module. You can cross-connect them, if units does not sync to see if RX/TX receptions are not mixed up. Insert the other end of the fiber optic cable in your remote network device or 2nd media converter making sure to keep track of which ones are the TX & RX connectors. Insert the power cable plug directly into its receptacle located at the back of the SFP. Plug the power adapter into an available AC socket. Check the LED’s as the device is powered on to verify that the Power LED is lit. If not, check that the power cable is inserted correctly into the unit and securely plugged into the wall outlet. Check the Network connection LED’s to make sure you are connected and able to transmit data. IMPORTANT! While this converter’s UTP side port is autosensing type, and will auto adapt to 1 Gigabit (1000M) or 10G speed, for converters to work, and sync – it is necessary that both sides of converters including fiber transceiver module are 10G speed – if at one side of converter UTP port will be connected to 10G UTP port, and another side – at 1 Gigabit port, whole link will not work, speeds must match. Power is on and normal. Connection status display for Fiber Link. “ON” indicates that Fiber link is in correct connection. Active status display of fiber link. “Blink” indicates packet goes through FX end. Transfer rate of electric interface is 10Gbps. Rate of electric interface is less than 10Gbps. Connection status display for electric link. “ON” indicates that electric link is in correct. “Blink” indicates packet goes through TX end. In this video we are testing this 10G converter in standalone mode with Huawei Quidway S9306 switch 10G uplink. You can see that these converters are really universal, and you can use them as well as with 10G SFP+ transceivers, or also use 1.25G SFP modules, thus getting or Gigabit or 10G uplink. One important note here is – and you can see we made these notes in video – if you use 10G SFP+ modules as plug in transceivers, then you also must connect 10GBaseT copper port, otherwise, units will not work.